“She Doesn’t Walk, She Soars” - read New York’s Daily News article headline, describing the ministry of song in Delia. She is a true inspiration to all those that come in contact with her ministry, be it by television, radio, periodicals or in person. Her heart for people has led her into full-time ministry where she encourages and challenges those within the church and those outside. Whether in a conference or concert hall setting, she ministers in the power of the Holy Spirit with a strong message that God has placed on her heart through song and also shares with the gift of teaching. 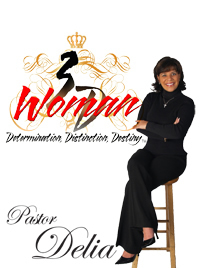 Her ministry has taken her to places throughout the United States, Africa, Honduras, Puerto Rico, Canada, the West Indies, Jamaica, Cayman Islands, Curacao, and she has been a frequent guest at Dr. Myles Munroe’s Conferences in the Bahamas, as well as at Bishop David Huskin’s annual Covenant Congress where she first met her husband, Dr. Levy H. Knox. She has been seen via television and periodicals throughout the world. She has been featured on the 700 Club, CBN, TBN, CTS, BET, Cornerstone and other television networks, as well as heard on the radio throughout the country and abroad. She is currently one of the co-hosts of a weekly television program called “A Different View”, which ministers the word of God dealing with real life issues, ministering hope and healing to viewers in over 170 countries worldwide via the TCT network which can also be seen on the DirectTV signal and affiliated stations throughout the world. She has also been seen co-hosting alongside her husband on TBN's Praise the Lord. She co-labors with her husband, Bishop Levy H. Knox in Mobile, AL where she is the First Lady of Living Word Christian Center. Lady Delia is the visionary of “3DWoman-Determination, Distinction & Destiny”, a ministry that ministers to the total woman, the Single Woman, the Wife and the Mother, encouraging women to be Determined to be set apart in Distinction, and walk in the Destiny as purposed by God. She is the Chief Editor of the recently released 3DExchange, a periodic magazine publication ministering to women. Delia is a member of the Advanced Writers & Speakers Association (AWSA). Delia is recognized as the Pastor of the Worship and Fine Arts Department of Living Word Christian Center. As an ordained minister, anointed Psalmist and Teacher of the word of God, she lives with a passionate vision to see Psalmist and Worship Leaders around the world take their rightful place in bringing forth a worship that speaks to the reality of the King of kings and Lord of lords. She is a chosen vessel unto God, with a special grace and wisdom that gives birth to a creative force that opens the hearts to receive the seed of the Kingdom, and be sown with the greatest of efficiency. Delia has received accolades from her peers - the likes of Gospel Great Shirley Caesar have said, “Delia sings better from this wheelchair than most of us do standing up!” International Gospel Artist Alvin Slaughter is quoted, “Delia ministers in the power of the Holy Spirit with a strong message that gets to the heart and it’s reflected in her singing. She has an incredible testimony and every song is a sermon.” Her father in the Lord, Dr. Tommy Reid of the Tabernacle, Orchard Park, NY has included in the acclaim by stating, “The story of Delia’s life is so inspiring that had she lived in Bible days, her story would probably been told by the writers of the scripture. She is living proof that faith transcends our circumstances! You don’t just hear Delia, you experience Delia.” Secular audiences also herald her. The New York Daily News-one of New York City’s largest newspapers stated in a feature article “Delia doesn’t walk—she soars!” However, what may be most impressive about Delia is her faith in God. Although she has ministered before great men and women of God, including the late Mother Theresa, she does not sing seeking the applause of man, but solely for her passion for God. Her spirit is applauded as she lives her life as more than an over-comer, even though a tragic car accident could have ended her life on Christmas Day 1987. Yet, her attitude towards her physical challenge is, “I don’t allow this wheelchair to control me, I control it!” Delia refuses to allow adversity to become a “crippler” in her life as some might suppose. As best stated by her husband, Bishop Levy H. Knox, “Delia doesn’t just sing a song, she becomes the song”. Delia considers her recordings as chapters in her life. She was actually one of the first to record the song Alabaster Box which deals with the issues of being broken before God, whereas we can pour out ourselves to Him. The end result being molded and conformed towards perfection in our walk with Christ. Alabaster Box also features a duet with multi-Grammy Award, Stellar and Dove Award recipient, Shirley Caesar, called “What Kind of Love Is This”, penned and produced by another gospel great, Donnie McClurkin. As Delia states, the Lord did not leave her broken before His feet, but He has made her Whole Again, thus the sequel to Alabaster Box. Whole Again takes the listener on a spiritual journey through music with the ultimate message directed towards the victory the born again believer has through Jesus Christ. The main message of this recording is that through our broken places, God is made strong and He has the sole power to make us complete in Him. We must then reach for perfection that we find in His presence alone. This 3DWoman with Determination brought forth her Alabaster Box, with a Distinct touch came back Whole Again and now walks in Destiny with The Diamond Project, the long awaited new release which is a journey of passionate devotion, falling in love with the Lord at a higher dimension. It is extravagant worship lavishly offered unto Him who sits on the throne and unto the Lamb. In this intimate account, Delia explores the many facets of our Holy God in the sanctuary where He now dwells and will bring the listener to their knees prostrate before the Lord caught up in deep worship crying “Holy, Holy, Holy” with the intent to come forth with reflections of Radiant One!